Item is in good working condition. Battery is in working condition, but it has NOT been fully stress tested (worked fine for about an hour of play without any major battery rundown). Trending at $48.47eBay determines this price through a machine learned model of the product's sale prices within the last 90 days. APPLE IPOD VIDEO CLASSIC 5TH GENERATION. USB charging cable. 30GB - WHITE - MA444LL. We will do our best to make it right! 100% tested, fully functional. iPod Video Classic 5th Gen 30GB Black White Wolfson DAC + New Battery Warranty! Ipod is in good condition. iPod Video Classic 5th 5.5 Enhanced 30GB + Wolfson DAC Black White Transparent! THE FOLLOWING NEW PARTS WERE INSTALLED. ORIGINALLY A BLACK UNIT. Wolfson DAC best sounding ipod. 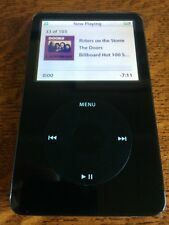 Ipod video 30gb Black 2202 songs. Songs will be left on unit and include a little of everything mostly rock and alternative. Ipod Video 30gb Black. Condition is Used. Shipped with USPS First Class Package. We don’t have a charging cable for it anymore so it will need to be reset. 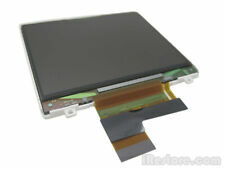 This LCD screen is 100% authentic OEM and compatible with all 5th gen & v5.5 gen models. 1x Apple iPod 5th/v5.5 Gen LCD Screen. Up for sale is (1) Apple 5th/v5.5 Generation iPod Video LCD Screen. This is a great opportunity to acquire a very rare factory LCD screen at a fraction of its resale value. iPod Video Classic 5th White 30GB New Battery + Wolfson DAC Free Warranty! IPod has passed a high-standard comprehensive test which covers all aspects of the iPod's functionality. iPod has a new battery installed and works great! 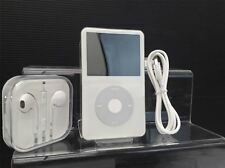 4.5 out of 5 stars - iPod Video Classic 5th White 30GB New Battery + Wolfson DAC Free Warranty! 48 product ratings48 product ratings - iPod Video Classic 5th White 30GB New Battery + Wolfson DAC Free Warranty! It is ipod classic video 5th generation 30gb. The iPod 5th gen 30GB is original version. 1pcs xUsb cable. All product is warranty. We will give you the best services. New Apple iPod Video Classic 5th Generation White (30 GB) MA444LL/A Warranty! Customs Services, Tracking Provided, Warranty!!! 4.5 out of 5 stars - New Apple iPod Video Classic 5th Generation White (30 GB) MA444LL/A Warranty! 677 product ratings677 product ratings - New Apple iPod Video Classic 5th Generation White (30 GB) MA444LL/A Warranty! This iPod's 80 GB of storage allows users to upload thousands of songs or hundreds of pictures to their device for great portability and accessibility. 1x Black video 5th 30gb ipod. Model iPod classic 5th Generation. Apple iPod 5th Gen U2 Special Edition - 30GB Model# A1136. There are still thousands of songs saved on the device. As well as 12 movies & 12 TV Episodes. The screen will need to be replaced if you want to see what you are watching or looking at. 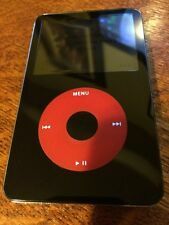 Apple iPod classic 5th Generation U2 Special Edition Black/Red (30 GB). Condition is Used. Works continuously when plugged in so I suspect it’s just the old battery. Very nice Apple 30gb ipod video (classic) with new battery. Faceplate is not new but looks like it is. MANY of the classic pop/rock are full albums. Pre-owned 5th generation white iPod video w/30GB of storage. Tested and working fine with no issues noted during testing. The 5th Generation iPod Video also contains a Wolfson DAC audio chip. It was rated 2nd in overall sound quality just behind the 5.5 gen. In Perfect Working Condition! This is a Black Apple iPod Classic (Video) 5.5 Generation 30gb. • The 5.5 (or "enhanced 5th") generation adds the "Search" function to browse your music, an option that is not available on the earlier 5th generation models. 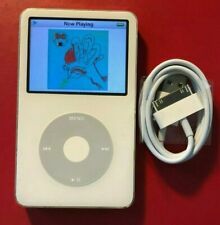 This is a White Apple iPod Classic (Video) 5.5 Generation 30gb. • The 5.5 (or "enhanced 5th") generation adds the "Search" function to browse your music, an option that is not available on the earlier 5th generation models. IPod Classic 5th Gen 30GB. This iPod Performs all functions as it should. This iPod is ready for your listening pleasure. (1) iPod Video 5th Generation 30GB (Used). Storage Capacity: 30GB. (1) Earbuds (New). Battery Type: Lithium-Ion (new battery). (1) USB Sync/Charging Cable (New). You are buying, using and possessing this item at your own risk. Apple iPod Classic Enhanced 5th (5.5) Generation 30gb (model no. MA446LL/a1136) up for sale. Item is tested and works. This model also features video. Received A-ok. A .
I will do best of my knowledge, to describe condition of item. Your item may contain visible or nonvisible imperfections including but not limited to the following Other non-listed imperfections. Cracks, crazing. Apple iPod 5th Generation 30GB Video A1136 MA147LL - Classic - Click Wheel. Condition is Used. Great deal! Drive tested and in very good condition. IPod holds 7500 songs, many hours of video, thousands of photos, and more on 30 GB of storage. IPod only. See pictures. Very good condition. Normal wear on front and back. Minor heat cracks on plastic front. IPod Classic 5th Gen 30GB Refurbished. This ipod is factory reset and ready for your itunes. Used iPod video. But screens back light doesn't work for the entire screen. Only half of the screens lights work. But usable. Although it was marketed as a portable digital audio player that also plays video, the Apple iPod Fifth Generation (with Video) was Apple's first entrant into the nascent portable video market. Apple iPod 5th Gen (with Video) 30 GB Specs. IPod Classic 5th Gen 30GB. This ipod is factory reset and ready for your itunes. 30GB iPod Video Classic 5th Black + Wolfson DAC Refurbished! IPod has passed a high-standard comprehensive test which covers all aspects of the iPod's functionality. iPod has a new battery Faceplate installed and works great! TH GEN BLACK. TH GEN WHITE. 3-IPOD CLASSIC 5. 2-IPOD CLASSIC 5. Do NOT open or reassembly the item, because we will not accept the item back. We will inspect the item when we receive the item. EXTRA INFORMATION. Model A1136. 5th Generation. Apple iPod. 30 GB Classic. Color: Black. (1) iPod Video 5th Generation Black Classic 30GB - NO Accessories - iPod Only. Model: iPod Video 5th Generation (30gb). NO Accessories are included. iPod ONLY. Verified to be fully functional. BATTERY LIFE not verified or promised. 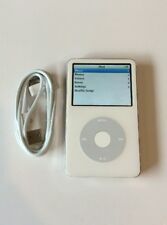 Apple iPod Video 30 GB 5th Generation White (PA002LL/A). With Lot of Extras. 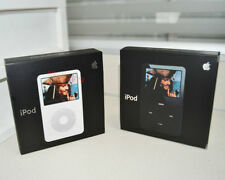 Note: For the latest version of this item, see the Apple 30 GB iPod with Video Playback (White). Witness the evolution of the revolution. First it played songs. Then photos. Then podcasts. Now iPod plays video, changing the way you experience your music and more.